Feeling brave, I would sometimes take my eyes off my footing and take in the beauty of my surroundings—such as the rain forest all around me and the TREES! The amazing, beautiful, enormous trees! These trees could be right out of the Tarzan movie or the Swiss Family Robinson’s tree house. 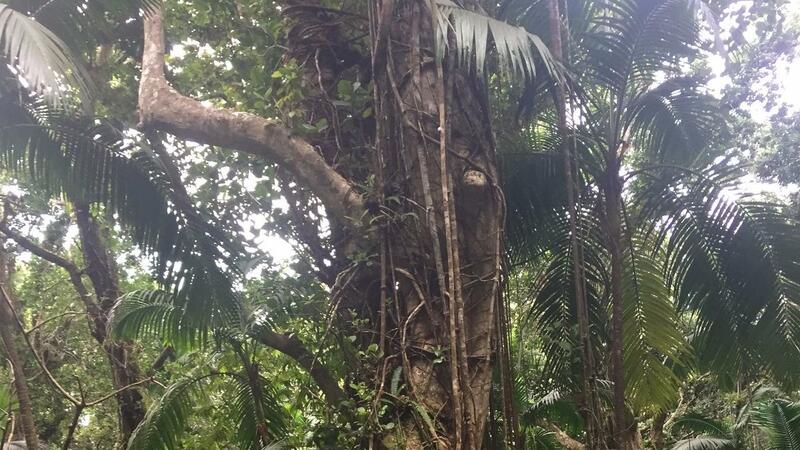 This rainforest had trees like the ones Tarzan slid down with his bare feet. It was incredible! love aged trees that are hundreds, if not thousands, of years old. So I was absolutely enamored by these trees! Not to mention the quality of the oxygen because of all the foliage. Next, I realize what a great opportunity this was for our family to take this expedition together. We worked very well together, looking after one another, laughing together, and enjoying the exploration. We even adopted Jeff from Canada, who jumped in and asked if he could call me Mom during our hike. My kids where like, “Sure, everyone else does!” He continually made us laugh and thoughtfully checked on me often. Helen, an older woman from Maryland, also became part of our tribe. We made sure she was doing well. Teamwork makes the dream work! We helped each other reach our goal—the top of the volcano. I love my family. If I was ever stuck on an island, or on the Survivor show, I would pick them over anyone. Trusting our guides and the process during our climb was a great life lesson. These guides do this every day. They know the way. They know what keeps you going and what hinders your progress. We ran into two girls who decided to make the ascent on their own. They started at 7:30 am. We started at 10:00. We met them on the path around noon. They were on their way down as we were heading up. They had gotten tired and decided to turn back with just an hour left to go. Our guides invited them to join us, but they turned down the offer. So they missed out on making it to the top. More than that, as we were about an hour into our descent back down the mountain, we caught up to them and found they had gone off track, got lost, and got stuck in a mini ravine. They ended up needing assistance and still didn’t get to the bottom of the mountain until 4:00—all because they wanted to “do their own thing.” They were exhausted, hungry, thirsty, frustrated, and angry. Let’s face it, I would be too if I didn't get to see my vision of reaching the top after all that hard work. These girls had a vision, but refused to be led. They were not willing to yield, follow, or receive help in order to bring their vision to life. They missed out. Sometimes our pride makes us want to go off and do our own thing. Then when we find ourselves in trouble, God in His goodness sends a “guide” offering help so we can achieve all the visions He puts on our hearts. If we are wise, we will humble ourselves and realize that He sent a proverbial lifeboat that has come to redeem our sorry butts! Too often, many people let the boat sail on by. Some are just that stubborn. They miss reaching their full potential. Many people miss the boat and then give up for all future endeavors. This is where dreams and visions die. Climbing Mount Misery (yes, that is the name of the volcano!) was beautiful. I loved the trees and the magnificent views. As I observed my surroundings, God had my attention. I was challenged, physically and spiritually, to be aware. I observed nature, the group, the relationships and personalities in a stressful situation, and the many life lessons this climb revealed to me. Believe it or not, this is not all I have to share about the climb. Join me tomorrow as I share what I saw at the top after a hard strenuous climb, and how I staked my claim!